・Additional crewmembers are transported to the ISS by Soyuz. ・Race participants compete to send high-definition images and videos to the earth until the end 2017. ・Atmosphere：With too sparse an atmosphere to impede impacts, a steady rain of asteroids, meteoroids and comets strikes the surface of the moon. ・Water：In 2009, orbiting spacecraft discovered water molecules on the moon. ・Oxigen：The crust is made of oxygen, silicon, magnesium, iron, calcium and aluminum, with small amounts of titanium, uranium, thorium, potassium and hydrogen. ・Radiation：It does not provide any protection from the sun's radiation. ・Long ago the moon had active volcanoes, but today they are all dormant and have not erupted for millions of years. 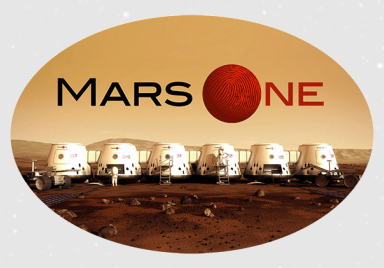 ○Mars One aims to create a permanent human colony on Mars in 2027. 2017　The first teams of candidates are expected to be selected and start training. 2020　A demonstration mission is sent to Mars to test technologies, while a satellite is placed into Martian orbit. 2022　A rover is launched to Mars to find a settlement location. 2024　Mars One sends a second rover, two living units, two life support systems and a supply unit to Mars, to form the habitat. 2028〜　Additional 2crews will land every two years. ○Mars One is possible with conventional technology, but funding is a problem. ○The SpaceX CEO has unveiled a vision for the colonization of Mars that he says will involve hundreds of reusable craft, each carrying somewhere between 100 and 250 colonists or so and also producing fuel from available resources on Mars for the return trips. 2018 Unmanned missions could commence. ・Water：there is ice in the basement. ・Due to the lack of a magnetosphere, solar particle events and cosmic rays can easily reach the Martian surface. ・Rradiation levels in orbit above Mars are 2.5 times higher than at the International Space Station. 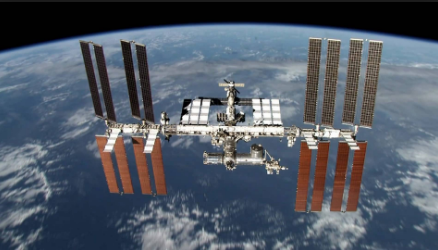 ○Now, why do we need space elevators? ○Because transportation cost of space elevator is 1/160 of the rocket. 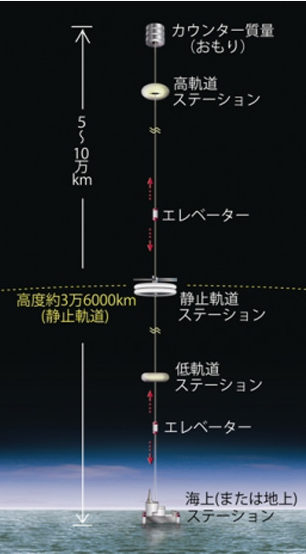 ○The estimated construction costs would be $10 billion. ○About 25,000 years later, Alpha Centauri will be 3.26 ly away. ・The Milky Way contains over 200 billion stars. ☆Depending on the movement of neighborhood stars, there is a possibility that the sun is close to the other stars. ○In about four billion years, the Milky Way will collide with its nearest neighbor, the Andromeda Galaxy. The two are rushing towards each other at about 112 km per second. ○After the Collision the two galaxy should settle into a smooth elliptical galaxy. ・This planet is only 40 light-years away. 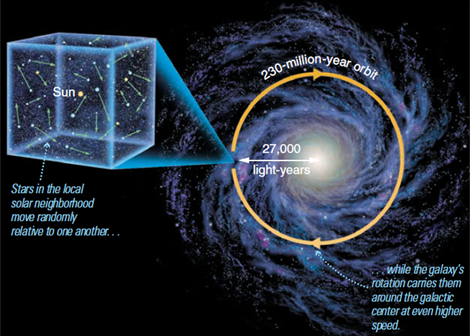 ・It takes 300,000 years for one way, 600,000 years for round trip by the spacecraft. 4. "Google Luna • X Prize (GLXP)"